Questionnaire: Should You Rent or Buy? 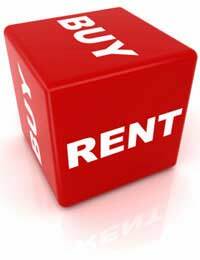 Home > Questionnaires > Questionnaire: Should You Rent or Buy? If you are about to relocate, then accommodation is a major consideration you have to make time for.Should you buy your new home? Or should you rent a property in your new location? Or perhaps you should consider renting now while you decide what to do in the longer term. 1. How long do you expect to be staying for? A – A long time. The new job is indefinite, I have no ties to where I am now and I can imagine myself staying for a number of years at least. B – It is likely to be for a couple of years – but I’m going to see how it works out. I still have friends and family in the place I am leaving so I may well wish to return. C – I’m definitely planning to return. The job is just for a year or two and I have strong ties in the place I am leaving. 2. How easy would it be for you to get funding to be able to buy another property? A – It shouldn’t be too difficult. I would either be a cash buyer of my next home or I would be guaranteed a decent mortgage deal. B – I probably could get a mortgage on what I’ll be earning but payments might be tight. C – It will be hard. I’ll have to pull out all the stops and will probably end up with high repayments. 3. How expensive are properties to buy where you are moving to? A – They are very good at the moment. This is an up-and-coming area and there are some bargains to be had. B – About the same as where I am living now – average for this country. C – They are pretty pricey. I’m moving to an affluent area. 4. What are rents like? 5. How easy is it to find rental properties in the area you are moving to? B – Not too bad. 6. How easy is it to find properties to buy in the area you are moving to? Mostly As – Buying a new home in the area you are moving to may well be a good idea. If high quality, well-priced homes are easy to come by then it is worth having a good look at what is on the market. It sounds as though you feel getting a mortgage wouldn’t be difficult and that payments wouldn’t be hard to make. If renting would leave you no better – or perhaps worse – off and you plan to stay for a while, then it could be worth considering buying. Mostly Bs – It sounds as though there could be pros and cons for each scenario. Check out the local market for both buying and renting very carefully then visit an independent financial advisor. Make sure he or she really is independent, then listen to what they have to say. It might be worth renting for a while, however, while you decide what to do and get an idea as to how long you might be staying. Mostly Cs – Renting may well be the best option for you. If you will be hard pushed to buy and renting will be easier and cheaper then that seems to be your solution. It also sounds as if you do not expect to be in your new location for very long. If your situation changes, you can always reassess. Questionnaire: Should You Sell or Let Your Home?